State, county and municipal governments are mainly in the business of buying services for their constituents, paying providers to tackle a broad spectrum of social problems -- health, education, employment, and justice, among others. But these governments face significant barriers to reducing costs and delivering high-quality services. Know what they spend, but not what they buy. Governments keep track of their spending, but have few, if any, quality controls to monitor what they're really buying. Governments have limited knowledge of what services are actually being provided and of the quality of those services. Prefer small, short-term benefits to larger long-term benefits. Rather than developing and implementing long-term solutions, governments overwhelmingly focus on fixing short-term problems. The emphasis is placed on fixing preventable problems, rather than preventing those problems in the first place. For instance, instead of funding obesity prevention efforts, we pay enormous sums to remediate diabetes. Why? Because the people in power won't be around when savings from prevention occur. Apply well-intentioned, intuitive programs with no evidence-base. The research literature is littered with evaluations of programs that sound promising, but don't work. Take D.A.R.E., for instance. Dozens of studies have shown that the program may be counterproductive, and may actually increase youth drug experimentation by exposing and demystifying drugs for kids who have not yet encountered them. Are underfunded to the point that effective programs are not scalable. For more than two decades, research has shown that drug-involved offenders receiving drug treatment in the community go on to commit significantly fewer crimes than drug-involved offenders who are incarcerated. Yet recent studies show that less than four percent of drug-involved offenders receive court-monitored treatment. The problem? Drug treatment is more expensive than criminal case processing and the resources to expand simply aren't there. Are risk-averse. Governments rarely fund programs that have excellent average effects, but occasional unintended consequences. While drug courts overall lead to less crime, it is inevitable that some drug-involved offenders treated in the community will commit crimes that incarceration would have prevented. While the overall effect is more public safety, the fear of the less dangerous side effects, like an occasional preventable crime, almost always wins out. Aren't designed for innovation. Not only are there substantial cultural barriers to new ideas in government, but the entire procurement and purchasing process makes innovation almost impossible. Nonprofits and commercial vendors cannot bring good ideas to government; government must solicit innovation (and therefore must come up with the innovative ideas for potential service providers to respond to). This reduces conflicts of interests and under-the-table deals, but stifles innovation. Have a "wrong-pockets" problem. Government budgets are split into department budgets, and split again into agency budgets. So if one agency or department has a winning idea that reduces overall costs to government, that idea will only go forward if that agency is the one that keeps the savings. If those who benefit from savings from successful evidence-based programs do not include the agency covering the bill, that agency or department is unlikely to pursue the idea. Don't share data and knowledge. Not only are budgets rigidly separated, but knowledge and data are as well. Each department tends to be isolated from the rest of government, particularly with respect to information sharing and knowledge transfer. For most governments, data systems not only can't communicate, but are often prohibited from doing so. If a child is in special education and involved in the juvenile justice system and the child welfare system, most places don't allow those agencies to share case information, much less encourage them to do so. Thus, the response is inefficient -- and the conflicting solutions can make problems worse. Don't communicate across borders. If the issues with communication and cost-sharing within governments are serious, the issues with sharing across governments are much more severe. Problems cross borders. Homelessness, gang disputes, pollution, poverty, etc. are not confined to particular geographies and the solutions shouldn't be, either. But intergovernmental cooperation is often almost impossible. The result is an inefficient system that at best can be made more efficient, and at worst can do more harm than good. There is a solution, however -- one that addresses all of these problems. I will discuss that tomorrow. 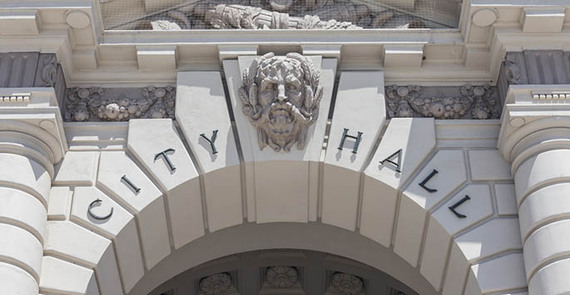 City Hall image from Shutterstock.